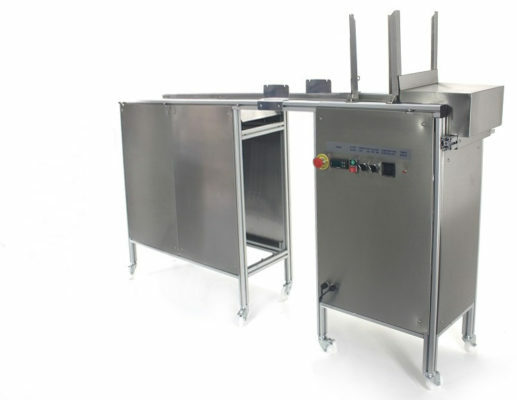 The INFINITY AML Automatic Solid Chocolate Moulding Line is designed to produce any solid chocolate moulded item using standard 275 x 175mm or 275 x 135mm polycarbonate chocolate moulds. It can deposit up to 100g per second with a maximum throughput rate of 600 moulds per hour. The INFINITY AML is designed to work with a 75kg INFINITY LX tempering machine. It consists of four stations. 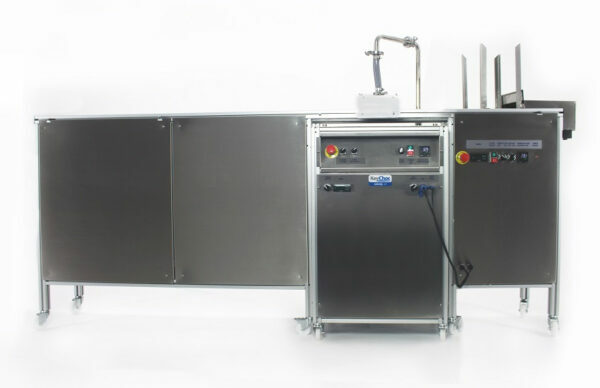 If you require mould pre-heating, please click here. Moulds can then either run directly into a cooling tunnel or can be manually removed and placed in a cooling rack. The INFINITY AML is supplied with a depositing head and one depositing plate custom made to suit any mould specified by you. NO independent power supply is required as the INFINITY AML plugs straight into the INFINITY LX. NO air supply is required as the mould-feeder is driven by an electric motor, not compressed air. Deposit timing is controlled by a built-in timer on the INFINITY AML so the optional INFINITY LX timer is NOT required. The vibrating station is built into the INFINITY AML so the optional INFINITY LX vibrating table is NOT required. Do You Make Flavoured Chocolate Bars? If you regularly make chocolate bars in many different flavours – whether it is different origin chocolates, flavoured chocolates or even just dark, milk and white – an INFINITY AML teamed with 3, 4 or even more INFINITY LX tempering machines could be a highly versatile and surprisingly cost-effective solution for your business needs. As the LX machines can each be “wheeled in” and “wheeled out” as you need, you can keep your moulding line going all day producing at the rate of 150kgs/hr, or until you run out of moulds!